In the Office of the Public Defender Rashanna Butler '20L split her summer between public defender offices in Lexington and Roanoke. Rashanna Butler is from Atlantic City, NJ. She attended Fairleigh Dickinson University, where she received a BA in Criminal Justice with a minor in Forensic Psychology. 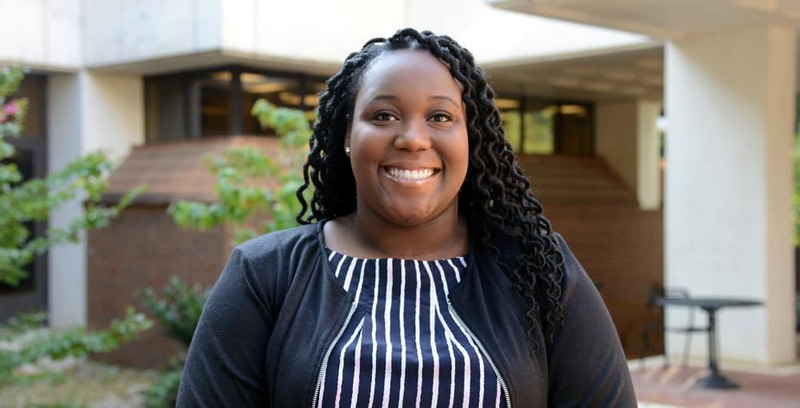 At W&L she serves on the Black Law Student Association’s executive board as the treasurer, and she is a proud member of the Pro-Bono Board. I decided to split my summer to make it more beneficial. I interned for the Roanoke Public Defender’s Office and the Staunton Public Defender’s Office. Both offices are under the Virginia Indigent Defense Commission. The Roanoke office serves Roanoke City, and the Staunton office serves Lexington, Buena Vista, Rockbridge County, Augusta County, Staunton, and Waynesboro. I began my summer with the Roanoke office in May and transitioned to the Staunton office in July. The Staunton office has a satellite office in Lexington, where I spent the majority of my time. I got the Roanoke position through Professor Mary Natkin. I mentioned to her that I was interested in interning at a public defender office, and she put me in contact with a classmate of hers, which led to a phone interview and job offer. During the semester I met with Ms. Andrea Hilton from the Office of Career Strategy, and she helped me compile a list of the public defender offices that I would apply to. I got the Staunton position by calling the office and asking what their internship program entailed. When my call was returned, it became an impromptu phone interview. I observed general district, juvenile and domestic relations, and circuit courts. I researched legal issues and wrote memos to aid attorneys with their cases. I also reviewed body cam and patrol car footage. I accompanied the attorneys to visit their clients in the jails and sat in on client meetings. I compiled discovery materials for the attorneys. I reviewed complaints and warrants for issue spotting. I attended trainings and performed various clerical duties. A normal day consisted of reviewing the calendar before court, meeting with clients, meeting with the commonwealth attorneys to discuss options, plea deals, and so on. My writing improved with the memos I provided to the attorneys. My research skills were strengthened because the time frame that I was given during the school year to complete a project was reduced to half. My communication skills were enhanced because I saw the importance of being precise with statements made to clients, commonwealth attorneys, and the court. Being able to express yourself in a short amount of time is vital because you may only have a brief moment to speak, and the most important points should be made first. For example, if a client is in court for failure to pay fines, the lawyer should lead with the fact that the client lost his or her job versus how the client used to be a good Samaritan. I was surprised to find out how small the legal community is. Also, I was surprised to see the amount of negotiating before and during court between the defense attorneys and the commonwealth attorneys. What was your favorite aspect of your summer work experience? My favorite aspect was being able to ask tons of questions to the lawyers I shadowed. There are many aspects of the court system, legal arguments, and lawyering techniques that I didn’t understand, and I had an open space for questions and answers. Has this experience helped you figure out your post graduate plans, and if so how? I knew going into law school that I wanted to be a public defender, and this experience solidified that decision. I was able to see up close the amount of work and dedication that a public defender must give to their caseload. Working so closely with the public defender offices, I experienced the good and the bad days. I know that being a public servant is a higher calling I would like to answer after law school. I have been offered the opportunity to continue my internship at the Lexington office, which I accepted. This summer’s experience will help me continue with my classes not only from a student’s perspective, but also from a perspective of someone who has hands on experience in the courts.